Flagellar-mediated motility has been demonstrated to contribute to the pathogenesis of Vibrio cholerae. Nonmotile mutants of live attenuated cholera vaccine strains are significantly less reactogenic in human volunteers, but the exact contribution of motility to virulence appears to be multi-factorial. The flagellum of V. cholerae is a complex structure made up of multiple structural subunits (>40 proteins). Expression of flagellar genes proceeds via a transcription hierarchy. This flagellar regulatory cascade controls not only flagellar gene expression, but also influences the expression of additional (non-flagellar) genes with proven or implicated roles in virulence. 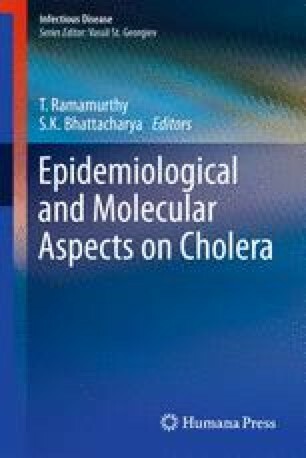 Flagellar-mediated chemotaxis appears to be linked to transmission of V. cholerae from host to host, and thus epidemic spread of cholera. Motility also contributes to biofilm formation, which facilitates environmental persistence. Thus, the flagellum plays an integral part in the lifecycle of V. cholerae, both in the host as well as in the environment. K.E. Klose is funded by NIH AI43486 and AI51333.